We wanted to give virtual reality a purpose, while pushing its limits and making it a fun experience for the user. 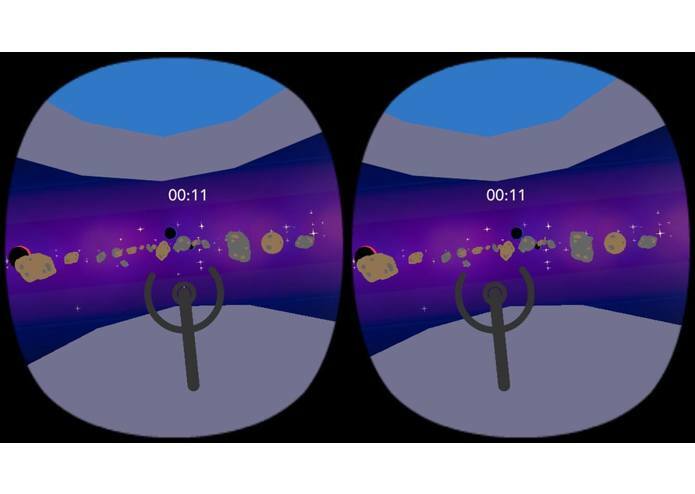 Our game immerses the user in the middle of an asteroid belt. The user is accompanied by a gunner, and the two players must work together to complete the course in as little time as possible. 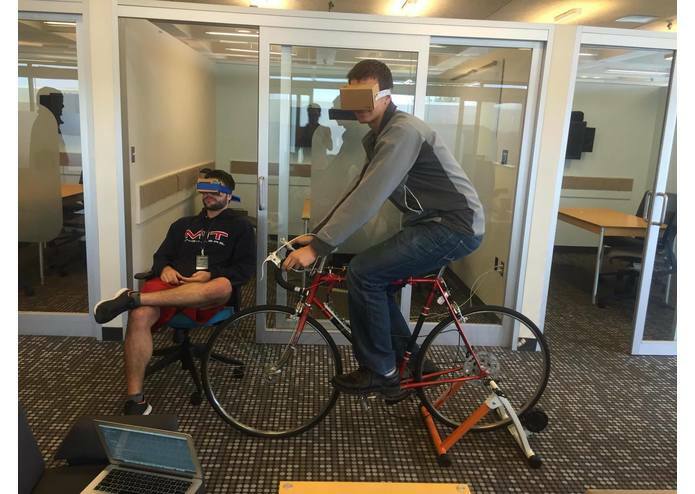 Player 1 drives the spacecraft using a stationary bike with embedded sensors that provide real-time input to the VR engine. Player 2 controls uses a wireless game controller to blow up asteroids and clear the way to the finish. Our entire system relies on a FireBase server for inter-device communication. 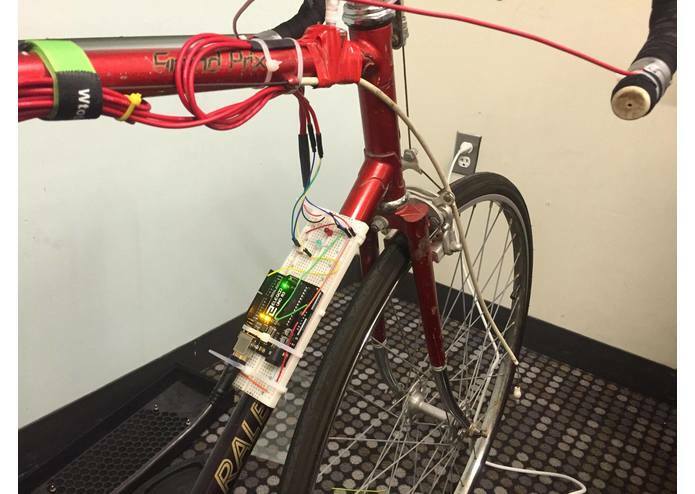 Our bike hardware uses a potentiometer and hall-effect sensor running on an Arduino to measure the turn-state and RPMs of the bike. This data is continuously streamed to the FireBase server, where it can be retrieved by the virtual reality engine. Player 1 and Player 2 constantly exchange game state information over the FireBase server to synchronize their virtual reality experiences with virtually no latency. We had the option to use Unity for our 3D engine, but instead we used the SmokyBay 3D Engine (which was developed from scratch by Magnus Johnson). We chose to use Magnus' engine because it allowed us to more easily at support for FireBase, and additional hardware. We spent a large amount of time trying to arrive at the correct configuration of hardware for our application. In particular, we spent many hours working with the Particle Photon before realizing that it's high level of latency makes it unsuitable for real time applications. We had no prior experience with FireBase, and spent a lot of time integrating it into our project, but it ultimately turned out to be a very elegant solution. 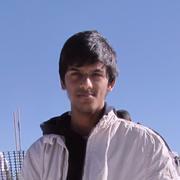 We are most proud of the integration aspect of our project. We had to incorporate many sensors, 2 iPhones, a FireBase database, and a game controller into a holistic virtual reality experience. This was in many ways frustrating, but ultimately very rewarding. In retrospect, it would have been very helpful to have a more complete understanding of the hardware available to us and it's limitations. Add more sensors and potentially integrating Leap Motion instead of hand held gaming pad. 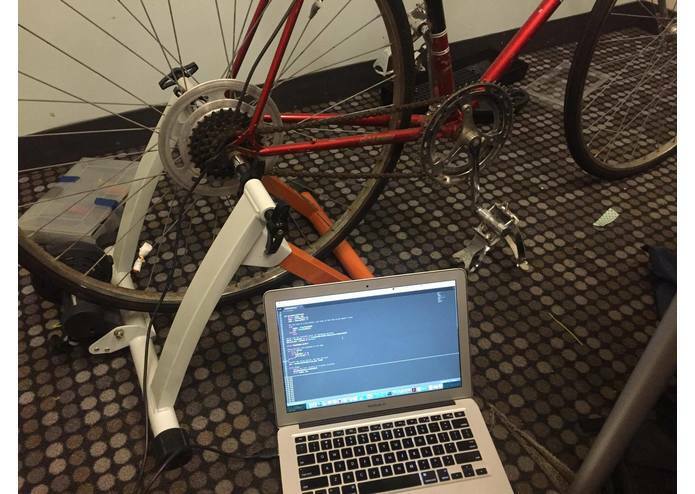 I put together the hardware on the bike, and worked on the Arduino code that reads sensor values, calculates RPMs and handlebar position, and sends the data to a computer over USB. I also wrote a Python script with Somi that takes in sensor data from the Arduino via USB, parses it, and continuously pushes the data to Firebase.